Notice anything different about the site? MakeUseOf has undergone some major cosmetic changes and is now looking better than ever. It’s not just great looks — we’ve sped up the page load time and added a bunch of new features we think you’ll really like. Read on to find out what’s new, then voice your opinion in the comments. For years now, the MakeUseOf mobile experience has been rather less than satisfactory — we’ve tried everything from a custom app on a mobile domain, to specialist WordPress plugins and themes How To Make Your Wordpress Blog Mobile-Friendly With WPtouch How To Make Your Wordpress Blog Mobile-Friendly With WPtouch Read More . We also fell back to the regular version of the site, hoping for the best — none of it worked well, and that’s why we’ve put responsive design at the heart of this new look. Now, the theme is fully responsive — that means it will adjust itself to fit accordingly, no matter what your screen size or browser width is. The same theme will look great whether you’re browsing from a 27″ desktop monitor, an iPad, or a mobile device. Unfortunately, the login screen isn’t compatible yet — it should fit on a tablet, but you may have some difficulty on mobiles. We’re sorry about that, and we’re working on it. We’ve upped the resolution of featured images on the homepage and articles so that if your device supports high resolution images, you should be seeing some gorgeously crisp photos. This applies to the MacBook Pro, the latest iPads, and any other device with a higher pixel ratio. Clicking through index pages is just tedious; now you don’t have to. Just scroll down to the bottom, and we’ll automatically load some new posts for you without the added wait of having to load a whole new page. When you find something you like the look of, hold CTRL and click to open the page in a new tab — that way you won’t lose the particular spot you were on the homepage. We have nearly 30,000 posts now, so you’re sure to find something in there of interest to you. Consider this in “beta” for now (yes, we’re that cool), but we know a lot of you would really like to save your favourite articles for later. Now, you can. Simply share any article on Facebook, Twitter, or Google Plus while logged in, and it’ll be saved to your account. Your profile will display up to 25 articles at the moment, but we’ll be increasing that soon. To see what you’ve saved, hover over your avatar in the top right, select Profile, and wait a few seconds while we retrieve all your data — bookmarks, comments, and questions from the site. Tired of that annoying download gate that asks for a password or share-to-unlock Make Your Own Tweet/Like/+1 To Unlock System with jQuery Make Your Own Tweet/Like/+1 To Unlock System with jQuery Going viral used to mean a disease epidemic, but now it's something all content creators crave. You could rely on the quality of your content alone - if it's good enough, people will share it,... Read More mechanism? You’ll pleased to know ALL of our free PDF manuals and cheat sheets are now easy to download as PDF, ePub, or even to purchase direct on Amazon for a minimal fee. In addition, most of the guides can now be read online immediately, without requiring a download. We wanted to make this as easy as possible for you to “MakeUseOf ” our incredible collection of helpful tips and tutorials, but of course, we would still really appreciate it if you tell your friends about the site! Don’t forget to check the huge archive of all our previous guides and cheat sheets. Enjoyed an article and want to find more from the same category? Just scroll down to the bottom of the page, and we’ll load the latest and most popular posts from that category, right there in your browser without you needing to navigate away. Want to quickly locate giveaways or trending posts? Scroll down the homepage until you find these red and orange post highlights. They are so easy to spot now aren’t they! We’ve come a long way since 2006 (see below: that’s how it looked before). For those that have stayed with us, we thank you for your continued support (and for not blocking our ads), and we continue to strive to keep publishing useful tutorial, tips, tricks, and reviews to help you with your Internet adventures. For those of you who are new here — welcome! You should stick around. Our mission has, and always will be, to help you achieve more with your computing devices. Finally, I’d like to take a moment to thank Namanyay, who joined us a few months ago as a designer and has been working flat out on this redesign. We hope you like it too, but please sound off in the comments with your feedback — good or bad — as well as any bugs you find (we’re only human). For bug reports, be sure to include browser, its version, OS, and if possible a screenshot. Thanks! 4 Reasons to Switch to Managed WordPress Hosting for Your SiteStuff I Found On The Web – Breaking Bad, Buying A Startup On The Cheap, & More! I don't mind the new homepage. My biggest problems are that the font doesn't seem to be a crisp black, but that may be my eyes. Just got new contacts and glasses and I don't think they're quite right. I access MUO the most from work on an older Pentium running XP Pro with only 1 Gb of RAM. I'm guessing that the animated advertisements are what's sapping my reserves. If I have more than 2 MUO tabs open in Firefox, my entire computer slows down to a SLOW crawl. I know, I know, it needs to be updated, but it's my work system and I have no control over that. Is there a way to even temporarily stop the ads from running? Otherwise, I love your site and the service you provide. I know this doesn't help much, but the new theme is actually lighter than the old one and faster loading - at least, the articles are. If the infinite homepage loading is causing the slowdown, set your bookmark to //www.makeuseof.com/page/2/ to bypass that feature. You can't please all of the people; ever. One thing I've learned about design; There is no such thing as consensus. Eventually you have to make an executive decision; and pull the trigger - because that's how YOU like it; and it is YOUR site after all. Very brave though; you certainly got your moneys worth from the participants. Keep delivering the great content; that's why we're here. The old setup was more professional than now. Don't like it. Too busy and distracting. Lifehacker went a similar route and all but ended my interest in the place. I have written some of my thoughts over at Justin's post, but I'll state them again as some of my view has changed (for better or worse). 1. Just realized that the theme is responsive. I always rant when having to read MUO from my mobile. 2. I still think that the sidebar images are too big. 3. No description on the homepage! How do I know if the article really contain what I think it might contain? 4.While the usual pagination has its quirks, infinite loading is...well...I tend to lose focus. 'Where I was again?' happened a lot. This is also one the reasons I stopped visiting HTG. 5. Alright, it's cleaner. I have to give point in this attempt. 6. I don't see any way to reply a reply. If I reply to the main comment, will everyone who replied to the comment notified as well? If not, this breaks discussion. If yes, it still breaks discussion as comments are not nested and it's difficult to keep track of who's replying who. 7.Very very sorry to say this, but I was surprised MUO would adopt metro-like layout. Having seen several sites like this, I have higher expectation at MUO. Not that the design itself is so bad, it's just too common right now. Best of luck, MUO! I'll still come for the content, but I hope the new design can mature to MUO's proud identity! It definitely has a cleaner look. although technically the layout is the same, but because of the cleaner look, it makes it seem like all over the place. still, the important thing is I continue to learn a lot more from the site. keep up the good work, MUO! I am an absolute fan of your website .However, the layout is all over the place and the infinite scrolling not for me .I guess I like the comfort of familiarity previous to the makeover. Forever a fan! I didn't read all the comments, but I like your new look. It is fast loading and has a much more up to date look and feel. I've been building sites for more than 12 years and you can't please everyone. In fact, if you get 50% that's pretty good. 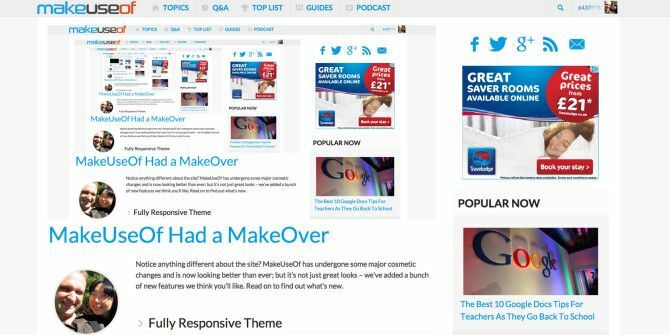 Using a responsive theme - it would be unthinkable not to these days - a CDN and good SEO makes for a site that is highly usable. What else could anyone want? I'm really not digging the lack of contrast and I actually do miss the long-format article excerpts; there have been times when I've been chosen to read and comment based on something I saw in the opening paragraph of a post rather than an generic or un-compelling title. I'm not sure I'm a huge fan of infinite scroll, either. If I'm doing a search for text on a page, it's now far less convenient to hit / (or F3 or whatever) than it is to just keep scrolling and scrolling, simply because I don't know at any point whether or not enough of the site has loaded. It's good to see you're working on making your site more "lively" and interactive, good job. Being picky though, the current color scheme doesn't really "pop", it's kinda dull, maybe experimenting with other colors would do the trick or you can allow users to choose from 1 or 2 other color schemes (sometimes being given a choice is nice). It takes awhile to get to the bottom of the page as well, but I guess that's to the continual page loading, I'm not sure if I like that feature or not. I can live with the new layout. I don't like it for many of the reasons stated in above comments. However, I can't find the 'like' and 'share' buttons for FaceBook, Google+, twitter, etc. I love sharing the article on my social media! I know, I know, I'm in the minority. This site, now so busy alike The Verge, is making me epileptic! I do agree that the site sorely needed a makeover, but this?! I know I can take it or leave it; the choice is mine. But, since no one really has anymore innovative ideas and simply copies each other, I guess more sites will adopt this format. I find the new interface much harder to read. I prefer a single column format instead of things scattered haphazardly across 3 columns. It's much harder to find a specific article that you want to go back to - You know it was within the last couple of days, so a full search shouldn't be needed. But having to look both up and down plus side to side is distracting. I missed this article twice when looking even though I knew it was there. It also take a bit longer to load - probably due to having to load more pics at the same time. You must have never seen Metro before. This is nothing near it. Metro has color and much more organized. This is more like Pinterest with no style mixed with Google monotonous color scheme. Thanks Victor. We're stumped on the like button, but working hard to find whats wrong with it. Horrible. I removed the site as one of my home pages. Except for retina display enablement and free pdf guides, the makeover is not appealing to me, in fact I feel this is not a user-friendly makeover. 1. This is really fast. A great improvement over the previous design. 1. The homepage looks a bit too crowded. A soon as a user opens the homepage, he/she is overwhelmed by a lot of boxes with big pics , little text & very little white space. I think needs a little visual harmony. Their should be fewer posts with more white space. And there should be some particular order in the posts. They are all presented together like a newspaper would.It might be good looking but doesn't make the page very easy to load. 2. The handing font looks a little awkward. It should be changed to something else & also heading color should be changed to something more subtle. 3. The social sharing buttons on the left that keep following u as u scroll don't blend in the theme at all & r very distracting. Perhaps u should consider removing them or at least fixing them to one place.If u ask me they should be replaced by static links (see how labnol.org handles them).This will have a good effect on speed as well. 4. This is a minor point but u should also test how this site looks on a feature phone.Had some trouble using it on my 3" inch feature phone. Overall a very good effort with great design.I have always been a fan of ur content & now ur theme also makes me come to ur site again & again. Cheers! P.S. Sorry for the long post but I love this site & wanted to contribute to make it look better. Also, the same font looks great in the post body. thanks for the input. I have noted down all comments and will be addressing them with our designers. You're not alone who doesn't like the homepage. We'll probably change it in the coming weeks. Thank You so much for considering my suggestions Aibek. Looking forward to even more informative articles & useful stuff on MakeUseOf. Keep up the good work. I am really liking the layout. My favorite website now has an even more awesome design. You guys rock! Thanks for the makeover, I'm enjoying it very much! The makeover is great. The fully white layout with different pages are gone. The new light colour theme are really good. The overall interface from text to buttons are good. But the front page with different grid size and cross horizontal 'text boxes' takes a little getting used to. Nicer than the previous one. Hate the front page. It's much harder to read than a vertical series of headlines and intros. Also noticed the site adds 100 MB to my browser load. Too much scripts and other junk going on. How about some good old fashioned HTML. Makes for a lighter site. The homepage total 2.9mb, mostly loaded asyncronously after the intial load; and is coded to modern standards of HTML. The theme is actually much lighter (in terms of load time) than the previous one. Not a big fan of infinite loading - I can deal with it but prefer not to. I like to scroll to the bottom and then scroll up to read newer posts. If there's no bottom, I end up in the abyss and have to time-warp back to today. Perhaps a return-to-top button would help, at least in the interim. The theme is good and the default font used on the website is much bolder and appealing. However everything became clustered and big that's crowded on the screen, it makes me uncomfortable. I would try to go for a smoother look, not as broad and simplistic. The new home page is confusing like that Google+ garbage. Colors are cluttered. I fixed it. Thank you! The site looks much better now with these tweaks. Tired of mobile only nonsense. Did someone design this on a non IPS display? Who came up with the idea to have all one color for everything, while copying Pintrest lame layout? I noticed this on several sites that have updated. All the tables have almost the same color as the background. There is nothing for our eyes to focus on. Way too washed out with gray and white. No border color, no shadows. Big fonts with the text rammed into your eyes. There is annoying social network buttons scrolling through the pages. I don’t give a damn about social networks. It looks so unorganized. I miss the good old HTML days when sites had a unique look. Oh, just discovered.... it looks like the new comment system doesn't handle quotes very well. When I typed a quote in my previous comment, it prints a backslash before the quote! It's fine when the page is refreshed. Bug! It will take some getting used to, but my initial impression is generally positive. MakeUseOf frequently adds articles, so often (in the past) I found myself having a backlog of many articles, meaning I had to hit the "next page" button at the bottom. The new system seems much better, since my "backlog" is all on a single screen. It seems you've removed the ability to log in with a Yahoo account, though. Have I missed something, or did you really remove it? Do I have to start over with my "points?" Anyhow, it's jarringly new, but I think I like it. New layout looks awful on desktop, I thought my browser was having some sort of formatting issue at first! Much preferred the old layout if I'm honest, this isn't doing anything for me and as said the wasted space is just ridiculous, even at 1280 only 2/3 of the screen is used for article space, hate to think what proper desktop resolutions look like! But.. the content column is *wider* than it used to be. It is wider, James, but the secondary column to the right reverts to white space below the activity stream, thus giving the impression of empty space. Additionally, I gather that WordPress, in utilising a set number of pixels in the center of the screen, displays well in smaller screens and portable devices, has issues displaying on wide screens. I love the new layout, but is there any way to put infinite scrolling on the comments too? On the giveaway pages in particular it is very noticeable. I really like the new look. It's very slick! Not thrilled about the main page, but i'll get over it. Dislike the new format. Will not visit here anymore. Don't give up on it too soon. There is much to like, and the whole purpose of this discussion is to reach a format that suits the majority, or so I do believe. I also miss the "number of replies" stat for an article in the article list, and the direct link to the Replies. I miss clicking on the # Replies and going directly to those replies without having to wade through an article I already read. While the redesign might look great on mobile devices, on my desktop monitor the front page looks much busier and disorganized then the old one. On a 19" monitor It looks big and in-your-face, quite overwhelming. The new labels will take some getting used to. However, I do like the way the new REPLY box functions. It is a bit more convenient than the old one. Agreed. Nice to have responsive design, bad to have 3 columns of block-shaped "tiles" scattered throughout the homepage (and not lined up left-to-right). Also, my preference is to read articles in top-down fashion without having to jump from column to column left to right. With the rows not being lined up, it is quite distracting. Engadget has a nice top-down flow, yet maintains a great responsive design. I love MakeUseOf, but this design makes me want to shrink my browser window to force a one column top-down design. @dragonmouth, I agree, the reply box functions work rather well, excepting the dificulty of formatting text. @Ed, thanks. It hadn't occurred to me to shrink my browser. I good solution in a pinch. Great looking re-design for a great website! 11. Why the comment formatting is totally absent? It makes comment look very bad. 12. Why can't I edit my comments? Bug; the actual comment is posted fine, but the message posted back to you is raw text for some reason. Will look into fixing that. I logged on the other day and was quite surprised by the new look. It will take a bit of getting used to with the new layout of articles (I didn't have any issues with the old way) but I'm sure it's all for the best. I can imagine the website looks really good on a tablet... speaking of which will we ever get a MUO app similar to android central? A cool widget would take pride of place on my home screen. If I go to a website and it sends me to RSS, doesn't that kind of defeat the purpose of the website. 1. The actual reading area on desktop is less than half the width. That means more area is wasted for the content I'm not interested in. 2. The header and icon don't really have any contrasting color, making overall look quite dull. 3. Search widget that pops when clicking magnifying glass icon, doesn't go away by clicking again. Inconsistent behaviour considering the same happens when clicking menu button. 4. Moreover, the search button is cutting from right, making only "Sear" visible on my Nexus 4 device. Bad padding maybe? 6. Infinite scroll? Maybe good, but have you considered that practically nobody will be ever be able to click those 5 links at the bottom? Or you wanted us to never click those? 7. Contrast, contrast, contrast. Currently it really looks washed out with existing color scheme. 8. Please try to have slide animation in menu list display in small screen mode. Fade-in makes it look slow, although it is not. 9. Hove on searchbox in home page, the search box appears then goes below the article below it. Z-index please. 10. Home page is good, but there's absolutely no description on articles. I mean even my feed reader provides 2-3 line of description so that I know f articles is relevant to me or not. If I ever have to come to your page directly, then I'll waste more time figuring out if the article is for me or not. Big dislike. Sorry for long post, but really want some changes here. You're not the only one with complaints. I logged on yesterday prior to this article being posted and immediately typed up my concerns in the Q&A area. The Answer so far is a suggestion of following the RSS feed - maybe I'm old fashioned, but I prefer browsing the actual website. - The new format makes it harder to sort the words from the pictures, whereas in the old format, I could scan the center of the page, easily finding those articles relevant to me. I do not have a tablet, instead using a vertically aligned 21.5" screen to view, specifically, makeuseof.com and other such websites. - Having limited time, I used to be able to scan the titles to pick relevancy, and to know whether to open an item, or move on to the next page. The current layout is much slower to scan, and cannot be easily read. The infinite loading resets every time I go back from the page I've opened, even when I have gone into a page which may (I think) have been 6 pages down the list. I am currently catching up on a months worth of articles, and would prefer not to open each in a tab, but rather to work backwards by date. - Should I wish to access the 'About', 'Contact', 'Advertise', or 'Privacy' links from the home page, I have a limited time span to click on them before the infinite loading function adds more articles to the base of the page. - I use a multi-link extension to highlight multiple links and open them in taps. This works when links are vertically sequenced, as with the old format. Your current layout gathers all links together, such that to highlight the link at the top left (ie. the most recent) opens the next 14 articles as well. (see http://tinypic.com?ref=2rhu62r). Please note this only happens in Chrome. - the contrast - the light blue, as per the brand colours works well if, as in the 2006 screenshot, it is surrounded by black and white, however, surrounded by vibrant pictures, it all but vanishes, such that the eye floats on by. - the reading area, particularly for long articles such as this. I have compared the perspectives of my vertical and horizontal 21.5" screens (see http://tinypic.com?ref=mtqssk) and am rather dissapointed. - the search button. It has to be clicked to allow the search field to show. If you hover over the button and move the cursor to the field without clicking, it goes into hiding (see http://tinypic.com?ref=256u5b7). - the fade-in. I thought the website had slowed down. - the lack of description. Images may be worth 1000 words, but they may as well be in another language if you don't know what's being discussed. The format of a website is pretty important to me, as I prefer to avoid websites or software (such as Windows 8) which confuse the eye and waste time. Any solution you could suggest would be worth trying, as I rather like makeuseof.com and would prefer to maintain it as one of my home pages. The desktop reading area is actually much larger where it can be, but you may be looking at a smaller screen, in which case it would scale down to fit the sidebar too. The links on the footer are kind of pointless on the homepage - we'll addressing that. You can click on them from any other page though. Anyway, your concerns are taken onboard and we'll be making some changes in the coming weeks - please bear with us until then, as these can't be changed overnight. Links in footer maybe pointless in homepage, but even on article page (like this), you auto populate posts and it still is quite tough to properly reach to the bottom, ensuring the link is not clickable at all. Btw most of my changes require CSS only modifications and can be done in a day or two, no more. I mean I'm able to change them locally as well. But till the new revamp comes up (especially home page description), I'm better off old way RSS reader. thanks for the feedback. noted all points! we'll be addressing some of them shortly. I had been losing my mind reading articles from makeuseof on my iPhone, so I am very happy about the update. Bravo! I'm enjoying the new look as well. This description seems like it was written to fit every SEO buzzword possible into the article though. New makeover is amazing, absolutely amazing, was so happily suprised when I opened my makeuseof guide to find it looking like this. Though I wish we had a 'favourite' articles without having to share them. Will possibly add that in the coming weeks, thanks for the feedback! you could always share them to facebook and put the visiblity to "only me"
I'm glad someone is finally addressing the makeover, because I woke up one morning and was like, am I on the right website? I do like the new layout, the front page takes a little bit to get use to. I think the new design looks awesome. Thank you so much to all the people that make possible to keep reading all this great articles. Congratulations!